It really has made a wonderful addition to my life, and was very simple to do. So far (December, 2003), the only mods to the trailer are the slot, a filtered roof vent (mounted high on the side), and a clamped filter mount for the slot that both filters the incoming air and firmly captures the trailer on the AstroPier. As soon as I get the foam cut I'll send some more pictures. In winter, I just let convection currents equilibrate the trailer, but I am adding a fan and will probably add air-conditioning and foam insulation next summer. I haven't sealed the slot to the AstroPier completely yet, but will do so quite simply with some cut-up foam pillows. I cut the slot with my Sawzall in about 20 minutes, leaving about an inch clearance on both sides of the pier, and it is pleasingly easy to push the trailer over the scope by looking through the pusher's window I mounted at the front of the trailer. The trailer doesn't need to be positioned very accurately for the filter mount clamp arrangement I'll show in the new pictures. One does need to be careful in choosing the trailer to be sure the door opening is tall enough (at least 80" from the ground to the top of the door opening with my 32" AstroPier), the floor structure is easy to cut, and the axle is not too far to the rear. I bought this one new for less than $1600. It's made by CM manufacturing, and it's about $800 less than the next-to-least expensive suitable competitor I could find. I'm sure there are plenty of used trailers that would work too. 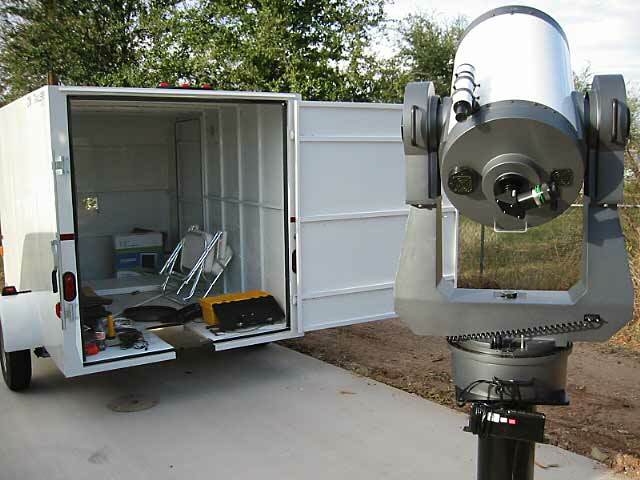 Interior of the trailer with scope, a Meade 16" LX200, in its storage position. 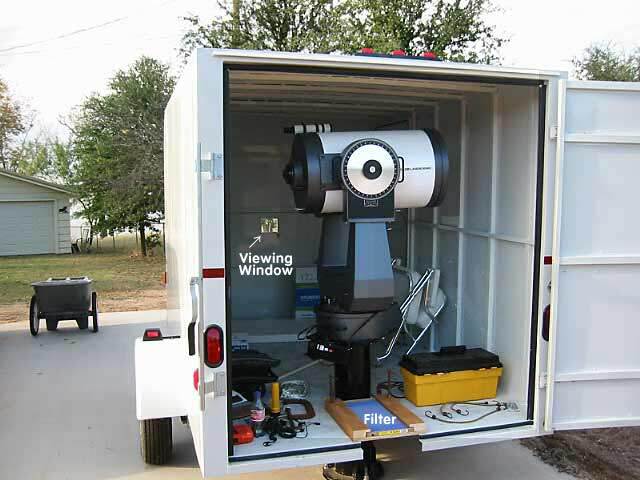 Trailer rolled away with scope in observing position.